Pull on a wool flannel bathing suit or hop on a rolling chair, it's time to go to Atlantic City, New Jersey, in the 1800s. Atlantic City grew from Dr. Jonathan Pitney's idea to make the New Jersey shore into a health resort. Development began in 1850. Atlantic City, with its beautiful beaches and luxurious hotels, soon became a popular summer resort and winter health spa. 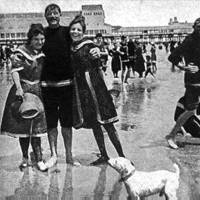 What kind of suit would you wear to the beach in the late 1800s? Women beach goers at that time wore bathing dresses of wool flannel with stockings, canvas shoes, and large straw hats. Censors roamed the beach looking for bathers who showed too much flesh. What could you do in Atlantic City after your day at the beach?